Petunias are beautiful, carefree flowers that seem to fill a space with laughter, maturing into tumbling masses of blooms that show from spring to frost, and they happily adapt to containers for a splash of color nearly anywhere. Easily one of the most popular annuals, they fill the air with a sweet scent that radiates from cascading streams of flowers. Best of all, petunias are notoriously easy to grow. In fact, all you need is a patch of dirt and, with even meager exposure to sun, petunias will put on an enthusiastic show! Grandiflora petunias produce large, showy flowers. With a penchant towards quality, not quantity, these petunias often display blooms that are 3-4” or larger in diameter, with single or double ruffled flowers. Cascading varieties are dramatic additions to hanging baskets, although not as hardy to wind and weather damage as Multiflora varieties. Bush-style plants mature to 12-15” in height. Multiflora petunias produce smaller flowers, but with huge quantities of blooms at any given time, the result is a garden that is positively teeming with color. These dainty flowers are usually single bloom, although double bloom varieties are available. Milliflora Petunias are considered great for borders or edging. Tiny flowers measure just one to 1.5” inches in diameter, but they add big color to containers and flower beds. Groundcover, or “spreading” petunias, are enchanting additions to hanging baskets, where they’ll frequently grow to 2-3’ or longer in trails bursting with blooms. These varieties quickly fill flower beds and walls, thriving in full sun. Petunias adore full sun and will put on quite a show when planted there, but they will even grow in light shade, although with fewer flowers. For best results, find a spot with 5-6 hours of sun exposure each day. Avoid standing water. Petunias do not require exceptional soil in order to prosper, but it must drain well. Mix in sand or raise the bed in order to promote drainage. Wait until danger of frost has passed before spring planting. Petunias will grow in nearly any area as long as the soil has reached a temperature of approximately 60 degrees, and will continue to bloom until frost. While petunias are not fussy and do not require excellent soil, plants are healthier and better producers if you mix organic material into the bed. Turn compost, manure, or peat moss into the top several inches of the soil to improve the bed. Before planting, fertilize with 10-10-10 at a rate of 2 pounds per 100 square feet. If soil is wet or slow to drain, mix in sand and/or raise the bed to allow for better drainage. Start seeds approximately 6 weeks before the usual planting time for your region (or after the last frost). Follow the directions on the seed starter kit to get your petunias off to a healthy start. Water seeds as needed to prevent soil from drying out. After seedlings sprout, thin plants to the strongest one or two plants per hole. Fertilize every two weeks with 20-20-20, following the manufacturer’s directions. On warm days, place the seedling tray outdoors, uncovered, for an hour or two at a time, gradually increasing exposure time to “harden” the plants ahead of transplanting. Once the outside soil temperature has reached 60 degrees and all danger of frost has passed, it’s time to put them in the garden! Whether you grew your own seedlings or purchased potted petunias, the process of planting them in the garden is the same. Start by finding a sunny, well-drained spot. Plan to space plants approximately 12” apart, with Milliflora varieties somewhat closer together and allowing slightly more space for groundcover petunias. Dig a hole that is slightly larger than the plant itself so that the surrounding soil will be loose and favorable for root growth. Backfill the hole so that the level of the ground will be equal to that of the dirt with the plant. Gently fill the remainder of the space with dirt, patting it firmly and gently to the ground. Water thoroughly at the time of planting to prevent wilting. Continue to fertilize with 20-20-20 as directed on the label. Protect new plants from wind, heavy rain, or extreme temperatures for at least two weeks following transplant. Petunias require very little maintenance. These easy steps will keep them at their show-stopping best! Mulch plants to help retain moisture and ward off weeds. Fertilize plants at least once during the summer, but avoid over fertilizing which may result in excessive green growth with little flowering. Allow top layers of soil to dry before watering plants. Excess moisture can cause mold, mildew, and disease in the plants. Remove dead or fading blooms to encourage new growth. Yellow foliage may indicate a lack of iron or nitrogen in the plant. The right fertilizer will correct this problem. Plant petunias on a cloudy day to help them adjust more easily to their outdoor location. 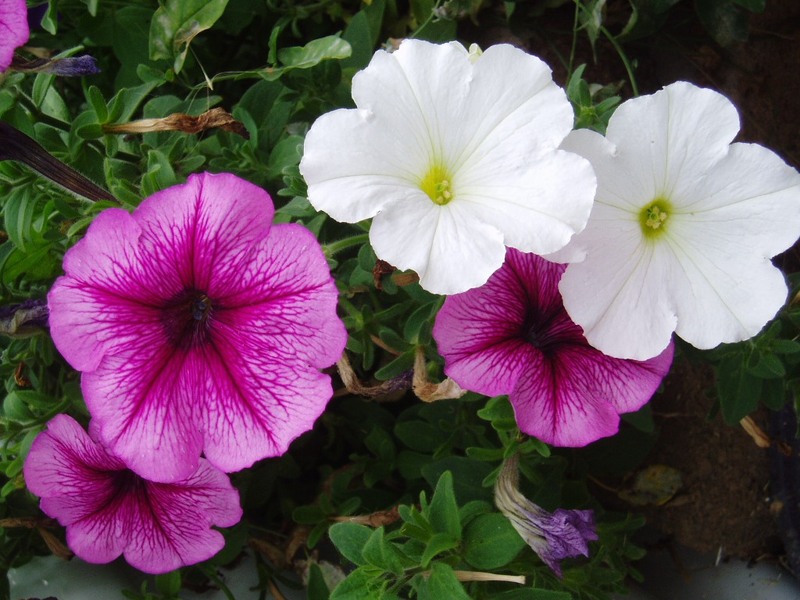 If you cut petunias for display, be sure to remove all leaves that may become submerged in water. Wet leaves decay rapidly, ruining your arrangement.